Save your AAdvantage Elite Status or read my guide to living without it. If you’re about to drop a level in AAdvantage Elite Status, or worse yet, didn’t re-qualify, you can still maintain your status with the AAdvantage Elite buy back program. Take action to maintain your AAdvantage Platinum or AAdvantage Gold Status through February, 2013! Having AAdvantage Platinum or AAdvantage Gold status offers special benefits that can make all the difference to frequent travelers when they fly. To help make sure loyal elite status members don’t miss out on another year of valuable benefits, American Airlines is offering a special opportunity for members who do not prequalify for 2012. Enjoy another full year of elite status by renewing your AAdvantage Platinum or AAdvantage Gold membership for a one-time charge, extending your status through February 28, 2013. Members who have made more progress toward elite status requalification during 2011 will benefit from lower prices to extend their status. AAdvantage Platinum members who earn at least 40,000 elite qualifying miles or points (or 48 qualifying segments), and AAdvantage Gold members who earn at least 20,000 elite qualifying miles or points (or 24 qualifying segments) during 2011 qualify for lower prices. To participate in this offer, you must be a current AAdvantage member with Gold or Platinum status and you have to have flown at least two elite qualifying segments during 2011. If you’re interested, go here to renew or for more information. Not everyone will choose to maintain their status, so I’ve put together a guide to help them regain the knowledge and skills required for traveling without it. This is a line. Now that you don’t have Priority AAccess, you’ll need to get used to standing in one. 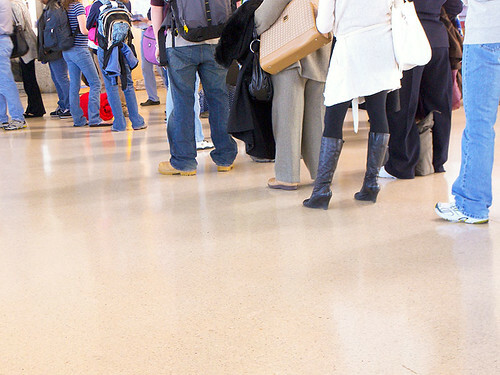 Now that your familiar with standing in line, you’ll also need to relearn how to wait your turn. You’re not going to be able to bypass the lines with Priority AAccess any longer. 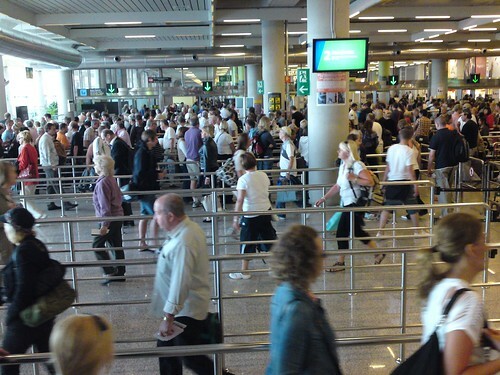 When you get to the security area, look for the long line. That’s the one you need to join. This is really going to come as a surprise to many people, but most planes have more than four rows of seats. Trust me on this. Once you get past that fourth row, keep going. There’s a whole other section back there. 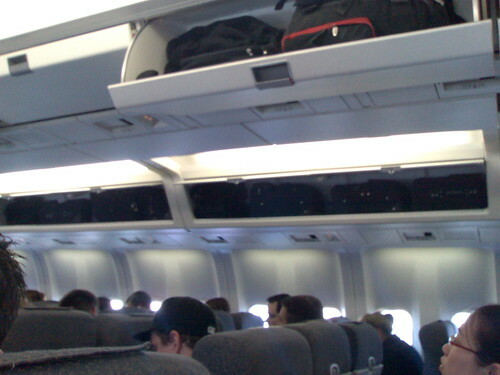 Once you get to your seat, stow your luggage in the overhead bin. Don’t waste time, the space fills up pretty quickly. After you put away your luggage, sit down in your assigned seat. Don’t panic when the flight attendant doesn’t come to get your jacket or coat. You’re responsible for putting it away. Also, be patient. It will take awhile for everyone to find their seats. 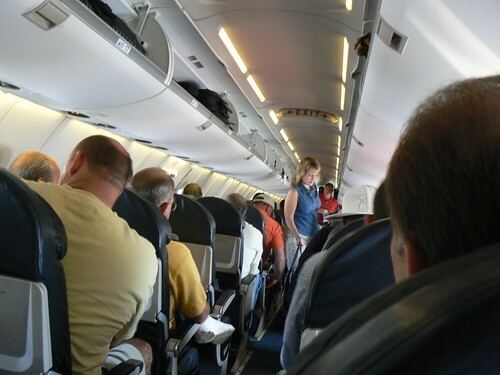 An airplane can hold a lot more people than you’d think. 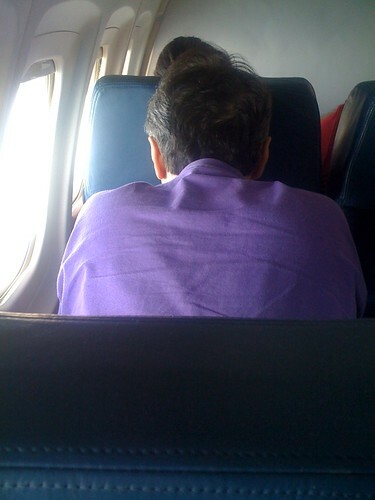 Once you’re in your seat, look down. Those are your knees. Get used to looking at them. They’ll be closer to your face than you’re used to. 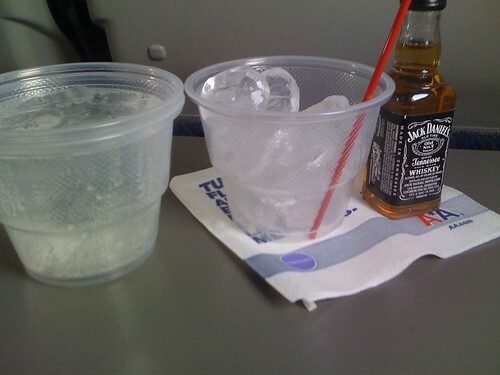 Unless you’re on an international flight, this is meal service. 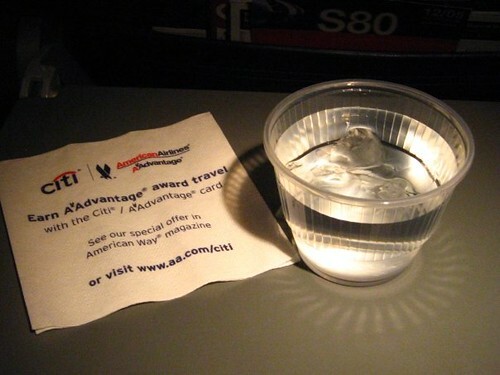 Note: the object to the left with the Citicard ad: it’s a napkin. It’s made out of paper and doesn’t have a button hole, but the upside is that you can take it home with you if you’d like. It’s best to bring your own entertainment. 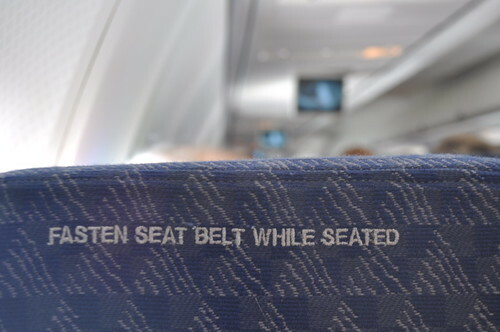 Otherwise you’ll be left staring at the “Fasten Seat Belt While Seated” embroidered on the back of the seat in front of you, or you’ll be looking at a small screen suspended from the ceiling (look closely, that’s the screen in the background). There are no lie-flat seats in this section of the plane, so rather than leaning back, you may want to try the leaning forward sleeping position. Here’s a really valuable tip that many people swear by: drink. It’s won’t do you any good to get drunk, but you might find that traveling without AAdvantage Elite Status is a lot easier if you have five or six drinks. I hope this guide has been helpful. 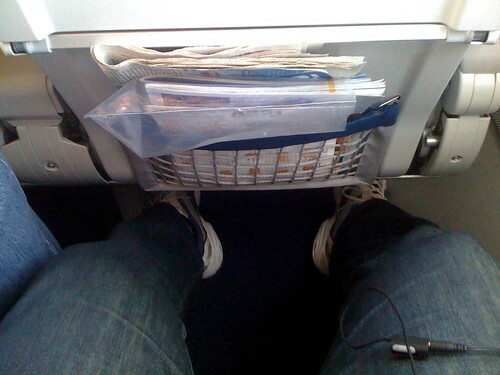 Remember, it doesn’t matter where you sit on the plane, you’ll still earn AAdvantage Miles. And one of the best things you can do with those miles is redeem them for an upgrade so you can get back up to the front of the plane. Later today, I’ll be announcing a winner in yesterday’s oneworld MegaDo related giveaway and offering another prize in a random drawing. Come back a little later for a chance to win! Love this! I am going to forward this to my Dad, who doesn’t get why I’ve been mileage running this month! @ Charles G – Thanks! How many miles are you going to earn in January? I’ll make sure the DW gets this, an a couple of short weeks she is sinking from GLD to thin flimsy plastic level. haha.. one of the best posts this year! Love it! These are the reasons I want to get to gold, great motivational or anti-motivational photos.